The British Aerospace 125 is a twinjet mid-size business jet. Originally developed by de Havilland and initially designated as the DH125 Jet Dragon, it entered production as the Hawker Siddeley HS.125, which was the designation used until 1977. Later on, more recent variants of the type were marketed as the Hawker 800. 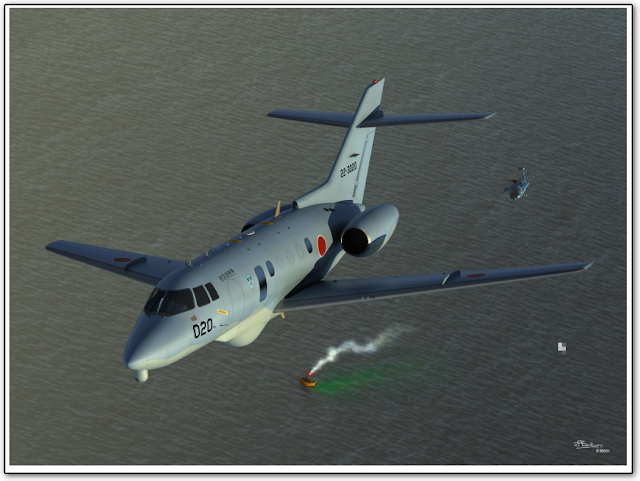 [...]The Air Rescue Wing Komatsu Detachment is a unit of the Air Rescue Wing of the Japan Air Self-Defense Force. It is also known as the Komatsu Air Rescue Squadron. Responsible for airborne search and rescue, it is based at Komatsu Air Base in Ishikawa Prefecture. It is equipped with UH-60J and U-125A aircraft.